Last week, we featured some of the most beautiful blogs that run as businesses. 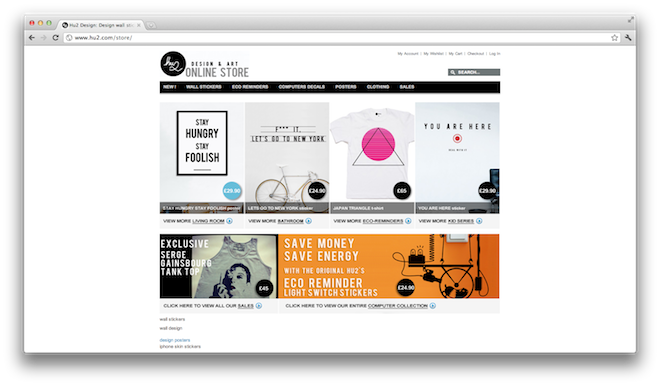 This week we’re taking a look at some of the most beautifully designed online stores. We can admit that narrowing this list down to just 10 was pretty hard, but we got a little something in there for everyone. From makeup, to design, and clothing to crafts, these 10 stores have some pretty unique layouts, and some pretty cool products to go along with them. Balancing a beautiful layout, which is easy to navigate and showcases your products, can be a huge challenge, and there are certainly a whole bunch of online stores out there that are doing it all wrong. These 10, on the other hand, have got their finger firmly on the pulse of beautiful design, and more. You would only expect the best from an online design and art store and Hu2 definitely delivers. The homepage features some of Hu2’s main collections, as well as some select t-shirts, stickers and posters. The London and Paris-based design agency is best known for its eco-decals that fit snuggly alongside electricity switches and outlets, as a beautifully designed reminder to conserve energy. Dakine is a store specializing in the skater, surfer, snowboarding world. With everything from clothing to tools to bags, there’s a lot of products featured on the site. The homepage layout with a grid of active photos, along with a bold font pulls the viewer right in, makes navigating the site to your preferred products as easy as ever. 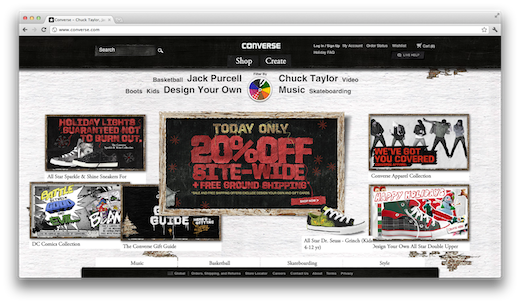 The Converse website is a perfect combination of interaction, design and stunning photography, and will probably end up keeping you busy far longer than you would expect it to. Our favourite feature by far on the site is the ability to filter designs by colour, so each page becomes a beautifully colour-coordinated showcase of some pretty cool shoes. Rice Bowls is an awesome organization with an awesomely cheery website which is only fitting for what they do. Order a rice-bowl for free, and use it to keep your spare change. Once it’s full, you can crack open the bowl, and send the equivalent amount via Paypal or by check. The money goes towards fighting hunger around the world. 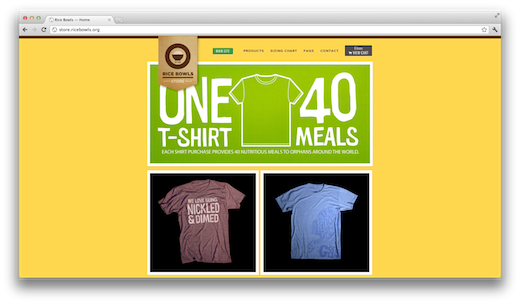 The online store features some awesome t-shirts, and one t-shirt can provide 40 meals for an orphaned child. The site’s colourful design, touching photos and great graphics make it an easy choice for this list, and the fact that it’s all for a good cause, is the cherry on top. 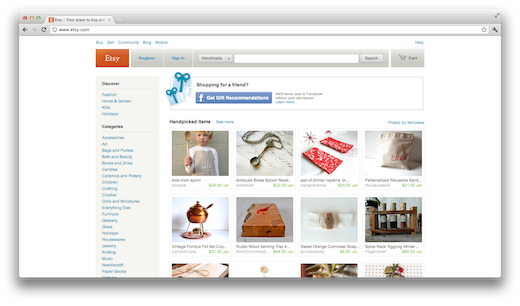 Of course Etsy is an an e-commerce site which needs no introduction. What really stands out about the site’s design and layout is the way that editors painstakingly go through the thousands of daily submissions, and create a gorgeously colour-coordinated front page. Its attention to detail coupled together with a clean and minimal design make it one of the prettiest online stores on the Web today. Clothing store Zara gives shoppers a beautiful full-screen experience which really lets the fashion photography on the site come to life. The site does exactly what it aims to do – make viewers lust after Zara’s threads. The snowflakes fluttering across the screen accompanying the winter collection usually come across as pretty cheesy on most websites, but for some reason, it simply works here. The full collection is featured in a simple, minimal grid, while each piece opens up in an individual full screen photo. 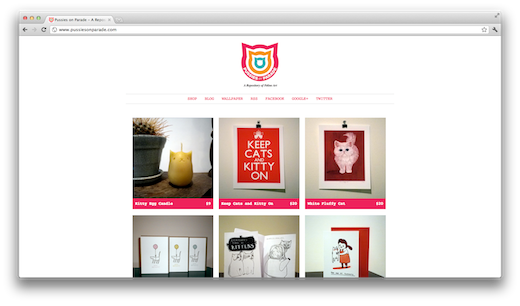 Pussies on Parade is a little slice of heaven for Web designers and cat-lovers alike. Featuring the coolest little collection of kitty paraphernalia, the site is a one page grid of cards, posters, candles and more. The hot pink accents and modern kitty logo give the page that little extra bit of kick that it needed to earn it a spot on this list. Since we’re among like-minded people here, we can admit that the Muppets poster on the homepage certainly temporarily distracted us from Blik’s design, but it wasn’t long before we were once again focused on the attractive layout. 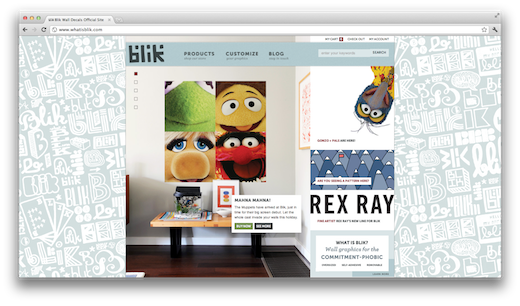 Founded in 2002, Blik bills itself as the world’s first removable wall graphic company. The whimsical design of the site goes perfectly hand-in-hand with the cute, modern posters, and if you manage to close the site without buying at least one product – we’re impressed. It’s no secret that we’re big fans of Swissmiss here at The Next Web, and by extension we love Tattly just as much. In keeping with Swissmiss blog design, Tattly is another easy-on-the eye, beautiful site, with clean and simple lines. Of course the über cool removable tattoo designs that are featured on the site don’t hurt either. The available temporary tattoos will appeal to any geek, designer, or just about anyone who has a taste for something a little different and creative. 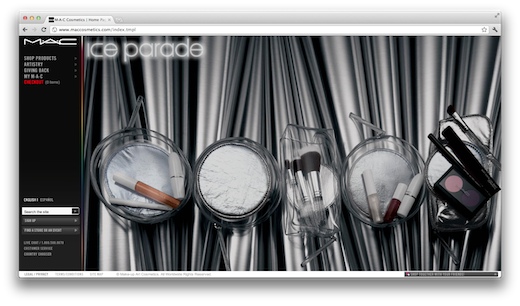 Mac Cosmetics is another online store which takes the full-screen approach to the design of its site, but opting for a darker colour scheme. The black background, neon accents and borders, along with full screen photos of the products make it a joy to navigate the site. What are you favourite, beautifully designed online stores? Let us know in the comments.